During a recent trip to Arizona, my husband and I enjoyed an entertaining stop at the Rooster Cogburn Ostrich Ranch along I-10, between Tucson and Phoenix. 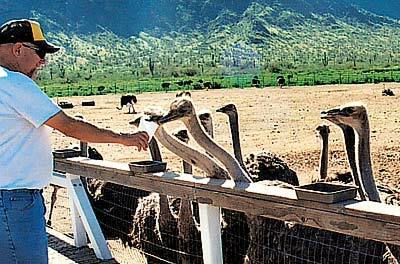 The ranch sells a lot of ostrich-related products, like infertile eggs for eating, feather dusters, oil and eggshells. But the best part was feeding these interesting animals. The cost of a cup of seed feed covers your admission fee. The ranch is on a frontage road, 1 mile east of I-10 (Exit 219), near the town of Picacho and Picacho Peak State Park, and roughly 50 miles northwest of downtown Tucson. It's open from 9 a.m. to 5:30 p.m. daily; closed Wednesdays in the summer. For details, call 1-520-466-3658.